While shoveling infinite amounts of snow I had a Tweet from Philip notifying me that Ninjini would be hitting shelves at most Toys'R'Us stores tomorrow! Several folks have already gotten their Ninjinis from Toys'R'Us. This technically shouldn't happen, but it is what some stores do for known, or regular customers. There have been confirmed reports of stores having either A: No Clue about It, B: as few as 8, and C: As many as 30-40. The Shipping Crate for Ninjini includes the following: 2 Ninjini, 2 Thumpback, 1 Eye-Brawl, and 1 Crusher. As for me and Ninjini...I am not sure. I have just learned to be disappointed by anything that TRU sends out a "hot toy alert" for because they always seem to stretch things out (kind of like times square). I have yet to hit the store on release day for any Skylanders related merchandise when they haven't been cleaned out and upon inquiring I find from employees they had very limited quantities. I honestly might just wait for GameStop or Amazon. Toys'R'Us is great when they have sales, but the rest of the time they just handle promotions poorly and tend to over hype things. If you do hit up your store tomorrow I would suggest you have them price match, although with Ninjini not out anywhere else, I'm not sure they will do it...There is no reason to charge an extra $1 over everyone else in the retail world. That said, they still seem to have the Buy One Get One 40% Off, so you could at least take advantage of that one...it kind of offsets the $1 extra price point. I've yet to hear of anyone confirming this, BUT there is also a small chance they will have other Wave 4 Skylanders like S2 Spyro, S2 Wrecking Ball, and maybe even L-LC Chill. If we don't see Chill with this grouping, I think we will see her before Easter, kind of like Dragon's Peak last year. Well...good luck! Hopefully there is the stock to match the hype this time. I wouldn't be shocked if a lot of the stock isn't held back until Sunday...the day AFTER the 40% Off Sale will end, lol. The TRU Express I goto had 4. 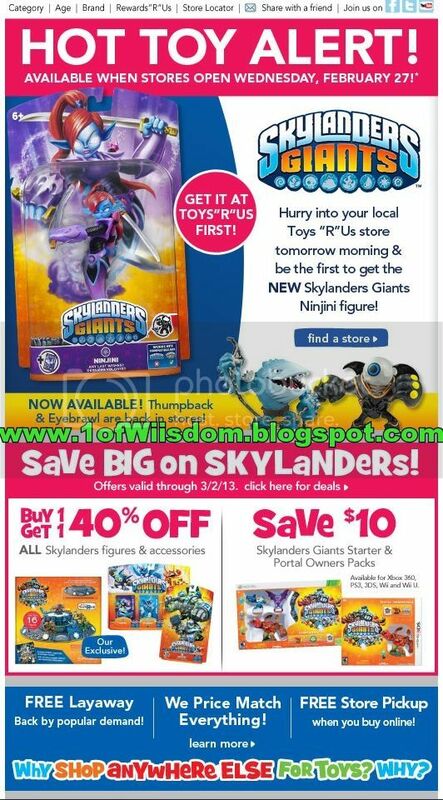 No other new Skylanders but they did have all the giants stocked for the first time in a long time. This is not a TRU exclusive so everyone else will have them when wave 4 fully hits. Nice...looks like you got pretty lucky with the low or limited stock. Online it seemed to be a hit and miss once more with some stores having stock and others dealing out rain checks. I was unable to go, but will pursue her tonight when I make my usual rounds. She was on Amazon off-and-on early in the afternoon...I had her a few times, but got the "item not available" when I went to check out. I will hope that the manager I talk to is at GameStop tomorrow night and I'll see if I can score some idea on time frames for W4. Very surprised they didn't unload some W4 singles today as well. Might also want to give a heads up about GS. All of the W4 characters are showing up as well, but as soon as I head to GS on Friday, i'll confirm if they're there or not. If I'm lucky, I'll go on and pluck at least three of them AND MHD if I get the chance. I also found Wrecking Ball, LC Chill, and LC Pop Fizz on Amazon and had them join Ninjini on their Wish List...she was off-and-on all day...just missed her a few times. If I get any insights I'll let you know! Good luck Friday! Nice...congrats on landing them! I told you I figured you'd see them Wednesday at the latest...I love being right, lol. I bet my local stores have them too...I just already ordered to be safe. People assume GS gets the same cases as TRU, WM etc...they do, but at the HQ...from there they open them, box them as they want, and then ship out...that is why you don't always see the same stuff...and never find variants, lol. Hope you land Ninjini! Don't if my Gamestop has Ninjini yet, but they have an unopened box of Skylanders Giants toys in the back, so if there is one of her there, they'll be sure to hold her for me for when I get off work. :D Here's to hoping Flashing gives me good luck today just like she was yesterday. Very nice! That'll knock out some accolades as well! Yup, and my Ninjini's fully maxed out as well, so that means that you can see her full stats, including her awesome speed (which another Giant shares as well, as I've found out), her HUGE HP (Don't know if the others will get that huge of a boost, but I can't wait!) and her pretty amazing Critical Hit Stat! Also, you'll see the comparison with her and Stealth Elf, and a glitch I found in Wilikin Village with one of the babies at the first part. Be sure to check it out! Nice, that was quick ;) I just checked it out on G+ before commenting back here. I can def see her being quicker than Crusher. I thought his #s were infalated after completing the HCs and then playing with him. I'm excited to take Ninjini thru the rest of the Speed stuff and see how she performs...I can't imagine anyone competing with Stealth Elf, but the numbers say she will. Maybe I can use her in some of the time goals. I think I've seen that, lol. Pesky Wilikin, haha. And you will be happy to know that Jade will have better base stats! when compared to regular Flashwing. I'll still use them for different paths when I record it all, but since most are S2 and well known I figured I'd help them out a little. Ah, that explains it...Bouncer def seemed quicker than Crusher, even when Crusher has the "Future Hat" (+10 Speed). I may go in and knock out a few more Heroics tonight. This'll be my last big purchase before it's time for vacation or getting any new books/games/etc. I hear that...hope you can land all of them quick and then save your money for the trip. Where you headed? Is it a Spring Break run?